Chris was born in 1970 in Gainesville, GA. When he was 18, he went into the military and served from 1988-1991 having completed a tour of duty in Iraq. He worked as a maintenance supervisor for apartment complexes for about 20 years. 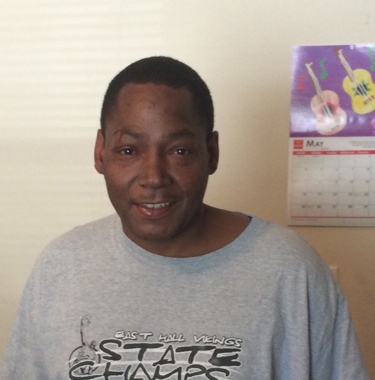 In 2012, Chris lost his license to work in his chosen field and as a result became homeless. Chris was referred to Homes of Light by United Way in December, 2013 and at that time began working on the Homes of Light Community Involvement Project. With this income, along with the United Way SSVF Team (Veteran Supportive Housing), he obtained permanent housing in March 2014. He then was connected to Furniture Bank. He is currently pursuing his HVAC certification at Georgia Piedmont Technical College with help from Veteran’s Retraining Assistance Program. Chris is enjoying his new apartment, enjoys fixing things, and plans on getting his HVAC certification by December, 2014.